The Yankee Candle Village flagship store in South Deerfield, Massachusetts, is the Disney World of candles. You can literally lose yourself for hours in its winding, cavernous showrooms and among its tantalizing scents—and admission to this perennially popular attraction is free. More than 200,000 candles under one roof is just the start. In fact, the Yankee Candle Village is billed as the "Scenter of the Universe"! In addition to finding the largest imaginable selection of Yankee's beloved candles in an endless array of more than 200 fragrances and colors, you'll find kitchen and home accessories, New England crafts, collectibles, toys, Christmas decorations including more than 100,000 ornaments, jewelry, fashion accessories, gifts galore, a candy shop and custom gift baskets. Be sure to pick up one of the handy maps of the complex: They're available near entrances. Find your way to the Black Forest room in the Yankee Candle Christmas Shop, where Santa and his elves toil year-round, and you’re in for a rare treat. It snows indoors here every day, and kids and grown-ups alike delight in catching snowflakes on their tongues… even on hot July days. Not snowing when you arrive? Just wait a few minutes. Yankee Candle Village also has a Wax Works, where you can make your own wax souvenir to remember your visit or a gift with personal flair. Options include hand-dipped critters and hand-dipped jar candles. or dip your own hand in wax to create a one-of-a-kind memento. Custom photo candles can also be created during your visit: They’re ready in just minutes. Educational presentations routinely take place in this exhibition space, where the history of candles and the Yankee Candle Company are traced right up through modern times. Bring your own picnic to enjoy outdoors, or grab a quick bite for breakfast, lunch or dinner at the first Au Bon Pain in western Massachusetts, which opened here in 2017 (replacing Chandler’s Restaurant). You can also fulfill your cravings for snacks and sweets at Ben & Jerry’s, Popcornopolis, Yankee Candy or the fudge shop. Yankee Candle Village hosts frequent sales, shopping promotions and events tied to the seasons and holidays, and you can always hunt for deals in the "seconds" room, where slightly imperfect candles and other decorative gifts are marked at a discount. Yankee Candle had the humblest of origins. In 1969, teenager Michael Kittredge set out to make his mom a homemade candle because he couldn’t afford a more lavish Christmas gift. When a neighbor noticed his efforts and asked to buy his creation, a business was born. Kittredge’s first store was in South Deerfield. In 1998, he sold his fast-growing company to Forstmann Little. Yankee Candle was worth about $1.8 billion when the company was acquired by the Jarden Corporation in 2013: What a New England success story! There are more than 500 company-owned Yankee Candle retail stores throughout the United States, and yet this candlemaking giant still maintains its homespun charm at its South Deerfield, Massachusetts, flagship store, which opened in 1983 and draws a half-million visitors each year. It is, by some reports, New England's second most popular tourist attraction. 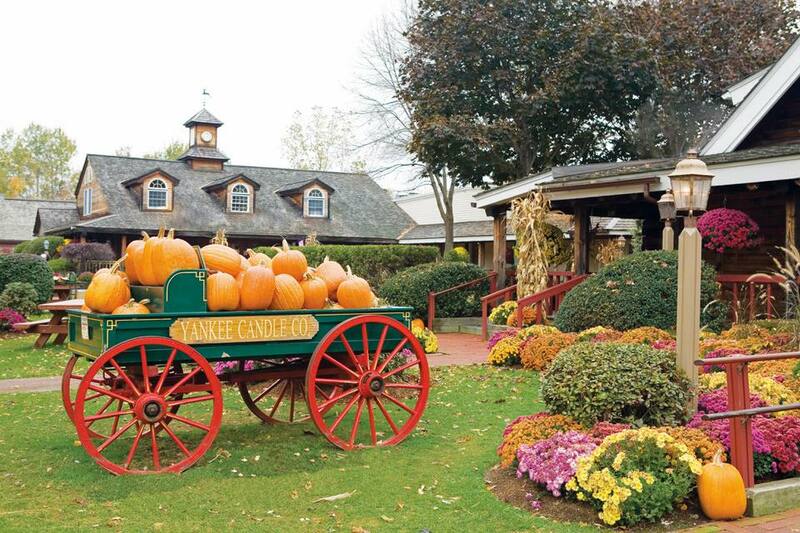 You can visit Yankee Candle any day of the year except Thanksgiving and Christmas Day. Hours are typically from 10 a.m. to 6 p.m. Holiday shopping hours are typically extended until 8 p.m. Thursdays through Sundays from late October through late December. The store may close early on Christmas Eve and New Year's Eve. Call toll free, 877-636-7707, for more information. These directions will help you find your way to the Yankee Candle Village flagship store. The Yankee Candle complex is handicapped accessible: Complimentary wheelchairs are available. Groups are welcome to make reservations to visit by completing this form or calling the Tour Department toll free at 877-636-7707. Groups are accommodated free of charge. With so many other attractions nearby, including the Magic Wings Butterfly Conservatory, Historic Deerfield, the Basketball Hall of Fame and the new $960 million MGM Springfield casino and entertainment complex, Yankee Candle can be the "scenter" of a fun-filled weekend getaway.